Mariananda has been a spiritual teacher and therapist for over 25 years, having lived and trained under the close guidance of the master, Mata Yogananda Mahasaya Dharma. She has taught and lectured overseas in Canada and New Zealand and throughout the UK, and has now established a retreat centre in West Cork, Ireland. She is qualified and teaches in-depth Pure Meditation (Raja/Kriya yoga), transformation yoga and energy care courses as well as giving natural energy healing (to people and animals) and progressive counselling and coaching. She has a very grounded yet deeply spiritual approach to her work – which she considers to be a joy and privilege. Working with people of all ages and abilities (including younger children and teens) her ethos is to help all to reach their potential and find wholeness. Her background includes working as a counsellor within the NHS and in private hospitals as an addictions counsellor and group therapist, as well as giving natural healing and yoga classes. She works with a number of organisations and charities offering workshops on energy management and self-care and is currently working in schools teaching a mindfulness and yoga programme. She has taught transformation yoga classes for many years and offers yoga as a therapy for all. 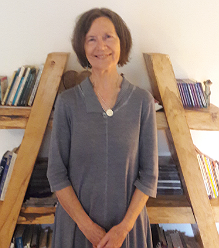 She currently works from her retreat centre – the quiet house retreat – on the beautiful wild Atlantic way in Schull, west cork, where she offers both personal and silent retreats as well as courses and therapies throughout the year. The quiet house offers 3 acres of peaceful gardens and a purpose built yoga and meditation studio called “the Ananda room”, accommodation is also offered with vegetarian food for residential course students or to those who wish to visit the area and stay in a nurturing environment. Mariananda dedicates this retreat centre and its’ work to her beloved master, Mata Yogananda Mahasaya Dharma, for her unconditional love and eternal guidance.